Modernization of agriculture has clearly shown not to be a viable solution for marginalized areas, while a mix of retro-innovation, fantasy and passion is showing a possible novel way forward for the re-utilization of abandoned areas and the revitalization of its socio-economic life. Torri Superiore Ecovillage is such as case, that I studied in my MSc-thesis (click here for my full thesis report), part of my Master Organic Agriculture in Wageningen Univesity. Torri Superiore Ecovillage can be defined as a bounded space re-created by in-migrants (new-rurals) that came and establish their lives in a place out from the mainstream society, utilizing external resources (both human resources and capital) and skills to revitalize through a neo-endogenous process the economic potential of a semi-abandoned low productive rural area. Agriculture in a marginal area can rarely be a remunerative activity. 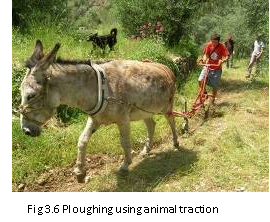 In particular if an area has been abandoned for years and offers no opportunity for mechanization. Making a living in agriculture thus demands a break with the mainstream perspective on agricultural production. A capitalistic approach to land use, based on the integration in markets, is barely impossible in these areas. However from a different rural development approach still work can be created in the production of quality food remunerating a little salary to built a decent life, allowing people to live as much as possible in harmony with the environment without depleting it from its natural resources. 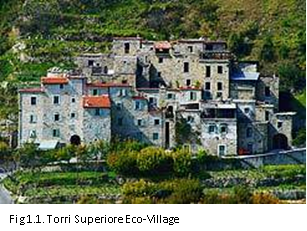 Patrimonialization, broadening, deepening, re-grounding, creating local outlets are all strategies that can stimulate the rebirth of a local nested economy embedded in the territory, as is the case in Torri Superiore Ecovillage. This case represents a positive experiment in the restoration of economic efficiency in a marginal rural area. Current policies discourses do stress the importance of creating proper conditions to make people stay in or return to marginal areas, but in practice the cost of the land, the bureaucracy and the taxes make it almost impossible for anybody to stay in marginal rural areas or for people without any experiences (so called new-rurals) to return to these areas. This entry was posted in Agriculture, Education, Research, RSO-student, Rural Development and tagged Italy, marginalised rural areas, Rural Development, Torri Superiore Ecovillage by RSO-Students. Bookmark the permalink.